, a man celebrated for piety and virtue, was born at Genoa, Nov. 14, 1653, being the son of Samuel Bonnell, merchant, who resided some time at Genoa, and of Rebecca, daughter of Thomas Sayer, near Norwich, esq. 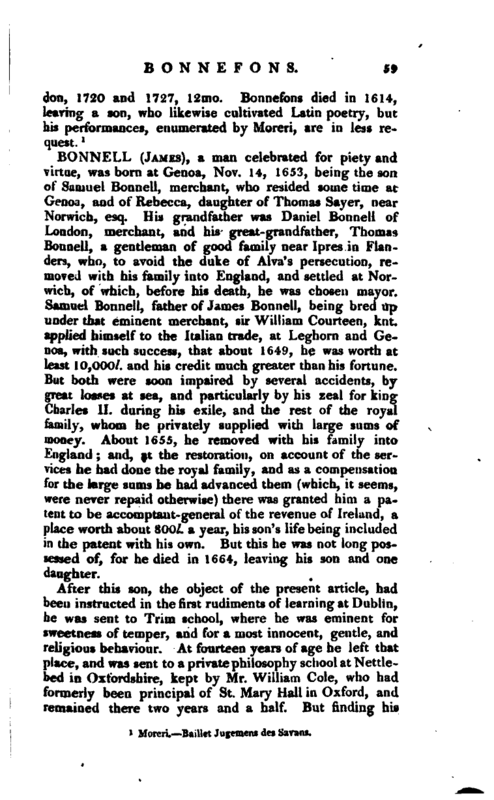 His grandfather was Daniel Bonnell of London, merchant, and his great-grandfather, Thomas Bonnell, a gentleman of good family near Ipres in Flanders, who, to avoid the duke of Alva’s persecution, removed with his family into England, and settled at Norwich, of which, before his death, he was chosen mayor. Samuel Bonnell, father of James Bonnell, being bred up under that eminent merchant, sir William Courteen, knt. applied himself to the Italian trade, at Leghorn and Genoa, with such success, that about 1649, he was worth at least 10,000l. and his credit much greater than his fortune. But both were soon impaired by several accidents, by great losses at sea, and particularly by his zeal for kingCharles II. during his exile, and the rest of the royal family, whom he privately supplied with large sums of money. 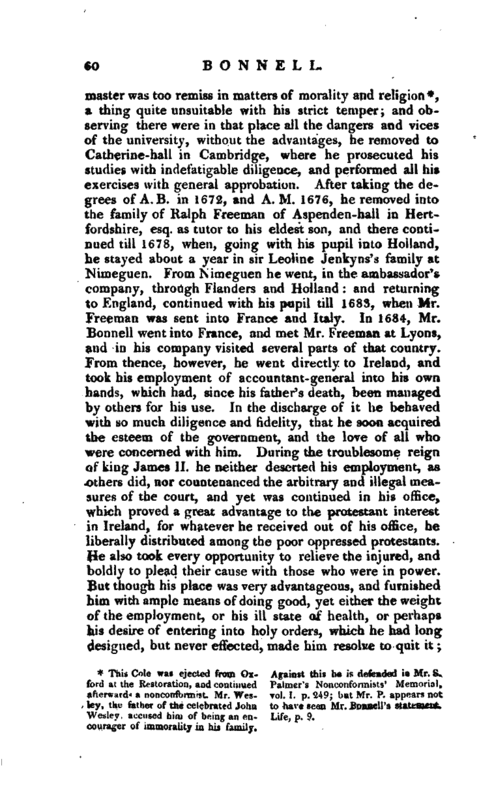 About 1655, he removed with his family into England; and, at the restoration, on account of the services he had done the royal family, and as a compensation for the large sums he had advanced them (which, it seems, were never repaid otherwise) there was granted him a patent to be accomptant-general of the revenue of Ireland, a place worth about 800l. a year, his son’s life being included in the patent with his own. But this he was not long possessed of, for he died in 1664, leaving his son and one daughter. This Cole was ejected from Oxford at the Restoration, and continued afterwards a nonconformist. Mr. Wesley, the father of the celebrated John Wesley, accused him of being an encourager of immorality in his family. Against this he is defended in Mr. S. Palmer’s Nonconformists’ Memorial, vol. I. p. 249; but Mr. P. appears not to have seen Mr. Bonnell’s statement* Life, p. 9. Biog. 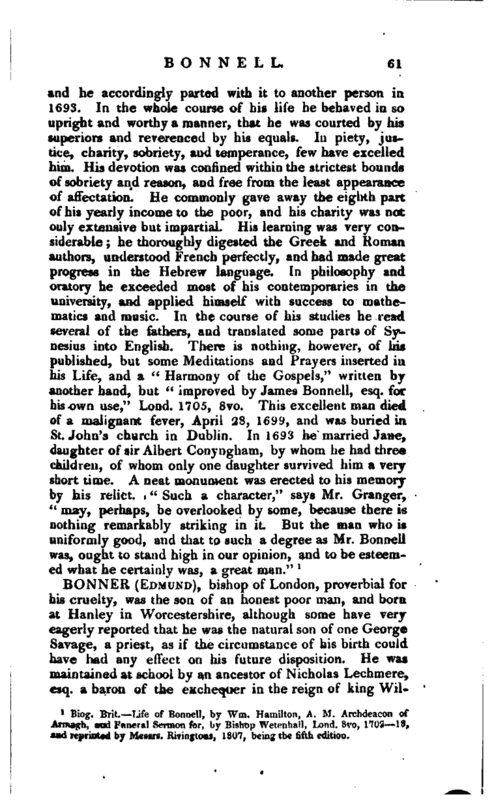 Brit.—Life of Bonnell, by Wm. Hamilton, A. M. Archdeacon of Armagh, and Funeral Sermon for, by Bishop Wetenhall, Lond. 8vo, 1708—18, and reprinted by Messrs. Rivingtons, 1807, being the fifth edition.